(2014/MightyCord) 12 tracks (43:30) digipac. 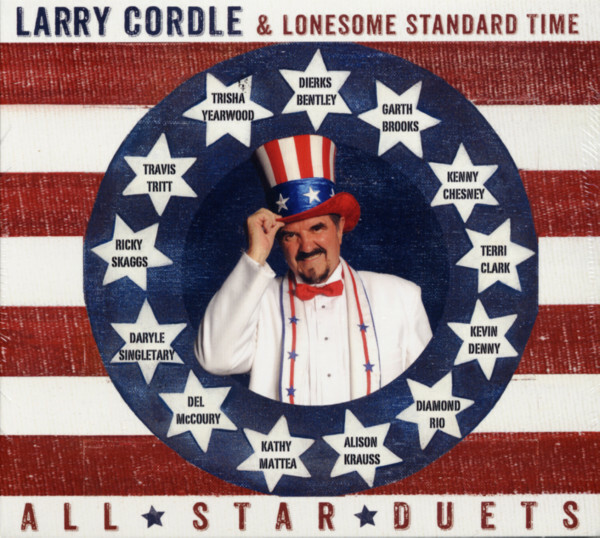 Songwriter, band leader, and background vocalist Larry Cordle invited several of his famous friends to join him on the album titled All-Star Duets . Dierks Bentley, Garth Brooks, Kenny Chesney, Terri Clark, Kevin Denny, Diamond Rio, Alison Krauss, Kathy Mattea, Daryle Singletary, Travis Tritt, Del McCoury, Rick Skaggs and Trisha Yearwood all make appearances on the project. Garth Brooks revisits “Against The Grain,” a track from 1991′s Ropin’ The Wind, while Yearwood performs “Lonesome Dove” (recorded for her 1991 debut album Trisha Yearwood). Diamond Rio offers “Mama Don’t Forget To Pray For Me” (recorded for their 1991 self-titled debut project), Mattea contributes to her signature “Lonesome Standard Time,” while Chesney joins Cordle for “The Fields of Home.” Daryle Singletary and Kevin Denny take on Cordle’s “Murder On Music Row,” famously recorded by Alan Jackson and George Strait. The all-star vocalists are backed by a band of all-star musicians, including Andy Leftwitch, Randy Kohrs, Bryan Sutton, Jerry Douglas, Ron Block, Tim Crouch, Stuart Duncan, Dave Pomeroy, Jack Pearson, Jay Weaver and Jenee Fleenor.